We're coming to your Neighborhood Meetings! Did you miss our Northside/ Southside Framework Plan Kick-off meetings? No problem! We will be at several neighborhood meetings in March and we're hosting another Southside Community meeting on April 15! Click the buttons on the right for meeting details. Can't make a meeting? Take our visioning surveys below! 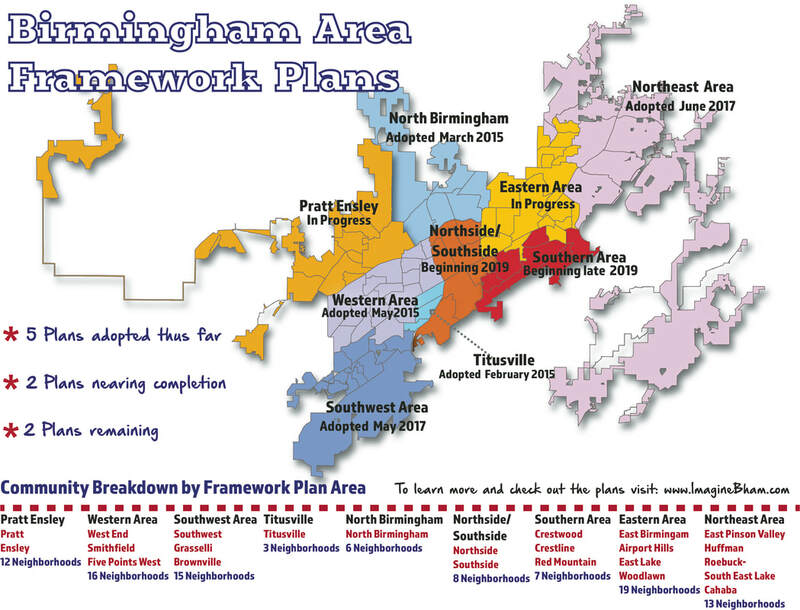 Missed our Northside/ Southside framework plan kick-off meetings in January and February? Central City, Fountain Heights, Evergreen, Druid Hills, and Norwood. Click directly on the map to view or download a high quality .pdf version from your browser. Several Framework Plans are underway! Click the buttons below to learn more about the Northside/ Southside Framework Plan, the Eastern Area Framework Plan and the Pratt Ensley Framework Plan! Get involved with Plan Implementation! ​Framework Plans are future planning documents that provide a clear vision of the kind of place the community wants to be in the future. The Community Framework Plan influences policies that have a direct bearing on quality of life. City leaders will look to the Community Framework Plans for direction on land use, new development, transportation, housing, parks, trails and open space, utilities and economic development. It will be used by elected officials and city staff as a guide for making short and long range policy and investment decisions – regarding land use development, zoning, transportation improvements, parks, trail, housing issues, and economic development. 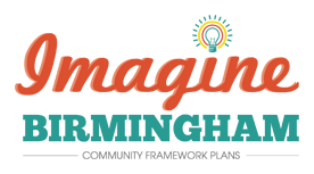 The Framework Planning Process is conducted by the Regional Planning Commission of Greater Birmingham (RPCGB), operating under contract to the City of Birmingham. This project is funded by the Building Communities Program. For more information visit www.rpcgb.org/community-planning/building-communities.